MERYL: Let’s start with the basics. What exactly is INFORMED DELIVERY? ADAM: It’s a service one can sign up with from the U.S. 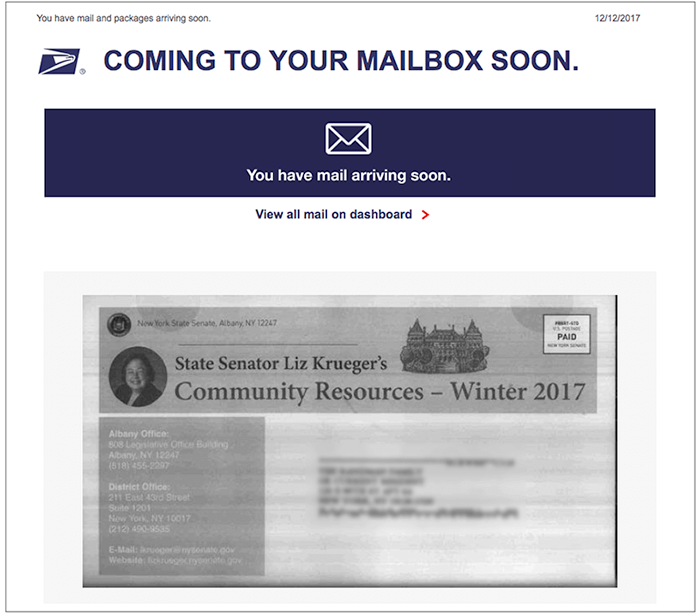 Postal Service, where first thing in the morning, people receive an email that lets them digitally preview in black & white their mail (see image above) and manage packages scheduled to arrive soon. This information is also accessible on the USPS website and INFORMED DELIVERY Apps. MERYL: Is this service available nationwide? And how many people have signed up? ADAM: As of July 12, 2018, there are 10,897,033 people signed up. MERYL: Is the U.S. Postal Service actively promoting INFORMED DELIVERY to get even more consumers to sign up? ADAM: Yes, and it’s also growing organically. MERYL: How would this help direct marketers? ADAM: It’s a new marketing tool. 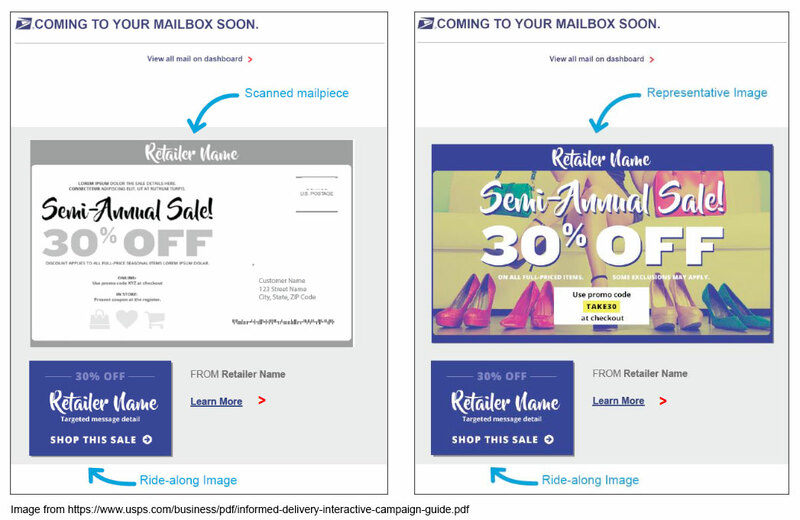 Businesses and nonprofits that are mailing can supply full color interactive content that will ride along with the digital preview. This enhances the customer call-to-action and reinforces a direct marketer’s message. It also allows the message to be changed and enhanced while the mail is en route. The possibilities are endless. MERYL: Can you give me a specific example of how it would benefit direct marketers? ADAM: Let’s say a nonprofit organization that focuses on disaster recovery has a spring appeal with us (the printer) and it will be mailing in the next couple of days. Then an earthquake brings destruction to an area. Wouldn’t it be great to tie that occurrence to the spring appeal? Now they can with INFORMED DELIVERY. A message can be added here to let the recipient know. This is called a ride-along. MERYL: The image below is an example taken from a USPS PDF of a ride-along. Could you please explain it more, so everyone is clear. ADAM: A ride-along can be a clickable button with a call to action, or anything that would enhance the direct mail piece you are sending. The image below also shows how you can swap out the grayscale image with a new color image. MERYL: Can a marketer know who on their list is using INFORMED DELIVERY? ADAM: The USPS is very careful of any information that they share with a marketer. To start out though, they will allow you to upload your mailing list and they will run it against the current registrants. They will tell you how many people on your file are registered with Informed Delivery, however they won’t tell you who they are. MERYL: Can a marketer gain any significant data? ADAM: Each marketer will receive a report that provides the general results of an individual campaign. It includes information on the number of physical mailpieces processed, the number of users/mail recipients that were sent an email, the email open rate, and the number of click-throughs. MERYL: How does a marketer get started? Is there a cost? ADAM: They can sign up on the USPS website. Currently there isn’t any cost to use the system. My company, Design Distributors, is happy to assist with the setup. Or, Meryl, I’m sure you can help them also. MERYL: I and others are amazed how this works. Can you please briefly tell us the technology behind it? ADAM: To begin with, every piece of First Class Mail gets scanned when it arrives at the Post Office. INFORMED DELIVERY just builds on that. Now, to be able to sync the color image or ride-along image you need to add mail.dat. Mail.dat is data generated by me (your printer) that I supply to the Post Office after I presort your mail. This data then needs to be added to your INFORMED DELIVERY job. Once that is done, images that go along with the mailpiece are synced up. MERYL: For personal use, why should someone sign up for it? ADAM: It’s very helpful in a variety of ways. It’s a great way to know when specific bills, credit cards, and important pieces of mail are arriving. In addition, if there are mail offers that you look forward to seeing you will know when they are arriving. Helps you keep an eye out! MERYL: Anything else you would like to add? ADAM: INFORMED DELIVERY is a win-win, for the both marketers and recipients. For some of the Gen X people who may have a hesitancy to go to the mailbox each day this product can certainly draw them there more frequently. MERYL: Thanks, Adam, for all this great information! Clients and colleagues: If you have any additional questions, or would like assistance getting started, let us know. Below you can find several useful links. Offering the most diverse lettershop and printing services in the New York Metropolitan area. They handle client programs from the time the artwork is received until it hits the mailbox. INFORMED DELIVERY App available free for iOS, Android, and Windows.